Welcome to District 12: The Hunger Games Adventures on iPad! The Hunger Games Adventures is coming to iPad! If you’re a fan of The Hunger Games book, movie, or both, we have some very exciting news for you: The official social game based on the story is coming to the iPad very soon — and it’s really good! 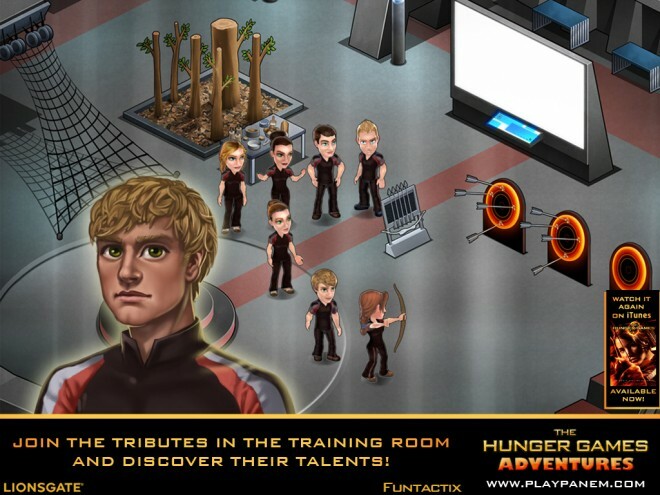 The Hunger Games Adventures game has been a huge hit on Facebook since the movie hit theaters in March. The iPad version is built from that game, but adds greater depth to the story, better graphics, and more intuitive controls. And the fact that you can play it from your iPad anytime without having to be logged into Facebook is a pretty big advantage, too. The one thing the game doesn’t have (although they’re working on it for the future) is the ability to transfer your character and stuff over from the Facebook version of the game. I would imagine this could be a bit frustrating for people who’ve been playing that version for some time, but the experience of the iPad game is different enough that many such people might find it fun to start over, anyway. The Hunger Game Adventures for the iPad will be available in the iTunes App Store very soon — the exact date isn’t yet certain. Fans of the story won’t be disappointed, I promise you. And probably a lot of not-yet-fans would have fun playing it, perhaps as a precursor to reading the book and/or seeing the movie . We play this game a lot, and not too sure if we'd be willing to completely start over but like the article says, we hope they eventually allow the Facebook crossover!